As a regular and respected writer on the city, the BigBarcelonaBlog is often asked for his considered thoughts on the possible emergence of an independent state of Catalunya. Okay that's a lie. Nobody cares what the BigBarcelonaBlog thinks. But is that going to stop the BigBarcelonaBlog opining? Of course it's not. The question raises contentious historical issues. Was Catalunya ever actually a country? Or is it more of a region? Or a province? Or simply an idea? And if it is an idea is it a good one? To pronounce with any knowledge on these weighty matters requires consideration, research and extended study. The BigBarcelonaBlog has thought about doing all this and decided it just doesn't sound much fun. So instead it has decided to resolve the whole problem with some much more fundamental (some would say basic, some would say dumb) questions which when answered will lead to an obvious resolution. Whose got the best flag? This is a little difficult to adjudge because it is not completely clear which flag actually is the flag of an independent Catalunya. Is it this one which flies outside the Generalitat? Or is it this one which flies outside many of the BigBarcelonaBlog's neighbours’ windows and is specifically aimed at independence? We can't be sure. The question being whether if they achieve independence the Catalans will adopt the flag that signals a desire for it or instead conclude that the pro-independence flag has now done its job and can be retired in favour of the traditional one. We just don't know. Though technically it's irrelevant. But very pretty. And gratuitous insertions of it do seem to increase the traffic to the blog. Hej to all my Danish friends. And hedge to all my Danish friends with big gardens. Back to the Spanish/Catalan flag debate. 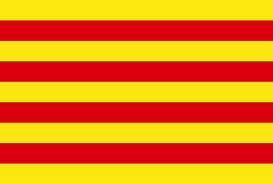 It's obvious that the Catalan is the bolder choice with more colours and more stripes and even a possible star. 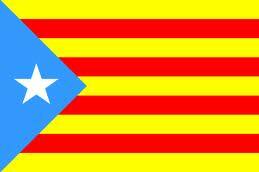 However, it could also be argued that the Catalan flag has too much going on - one man’s bold is another man's brash. There is certainly a lot to say for the classic simplicity of the traditional Spanish standard. But the real question as all fashionable people know (and what other type of person reads the BigBarcelonaBlog) is which is the more slimming. That's right. In these increasingly body-fascistic times when choosing a flag it is important to think whether it will show your figure off to its best advantage when brandishing it at National occasions. When all is said and done who wants to look tubby when going to summits or hosting the Olympics or just invading another country for no reason. And as we all know when going for a slimming effect the stripier the better. Strike one for Catalunya. Question Two Who has got the best anthem? Again this is a thorny one on the grounds that we don't actually know what the anthem of a newly formed Catalunya would be. However, in this case, it doesn't matter because whatever it turns out to be the Spanish anthem wins hands down. Why? Because it doesn't have any words. There’s no way the BIgBarcelonaBlog is in favour of getting rid of an approach as mature as this. One-all. Question Three Who has got the best language? Another tough question and one which the BigBarcelonaBlog confesses to be torn by. For example the Blog prefers “Adeu” to “Adios” but “Por Favor” to “Sis Plau”. Short of combining the two languages (which I think we can all agree is a non-starter) then what to do? I think it comes down to Maths and manners. In the end there are lots and lots and lots of people who speak Spanish, mainly thanks to Spain rather dubiously conquering lots of other countries and teaching them it at gunpoint (apparently, at gunpoint, is the quickest method to ensure people grasp the subtleties of the imperfect subjunctive…e.g. if I were to pull the trigger then you would be one sorry Aztec/Mayan/Inca…get the idea?) whereas Catalunya hasn’t managed to even conquer its own country despite hundreds of years of trying. And whereas the BigBarcelonaBlog is basically opposed to the nation state as a concept it is very much in favour of the continued speaking of as many languages as possible and so Maths and manners dictates that we should support the outcome which would allow the greatest linguistic diversity. What effect would it have on the Eurovision song contest? There is no doubt that the introduction of the Catalan entry could be the straw that breaks the Eurovision back. Already burdened by the many entries thrown up after the break-up of the Soviet Union (a much underrated outcome of the collapse of communism and one for which Mikael Gorbachev has yet to be held to account) the Eurovision song contest might have to become a two day event. A terrifying thought. In a continent already suffering a grave financial crisis this extra expenditure could send our shriveling economies spiralling into permanent economic slump. In these tough times, Europe just can’t afford any more uptempo bland synth pop. I’m sorry but that’s the way it is. And even more dangerous a Catalan entry might feature a flabiol solo. The BigBarcelonaBlog has always maintained that Barcelona feels like a a capital city without a country. It’s got the swagger, the attitude and the hordes of yappy gap year American students to prove it. But does that country it could be capital of need to be Catalunya? As we know part of the engine that is driving the independence movement is the financial problems of both Catalunya and Spain. Instead of simply separating these financial problems why not solve them? How? I hear the diplomats of Europe cry. Nobody knows what the capital of Switzerland is except the Prime Minister of Switzerland and even he is apparently not 100% sure. Berne, Zurich, Geneva – it could be any of them. What Switzerland needs is a really cool capital city and what better candidate can there be than Barcelona. There’s no international law that says a country’s capital has to be in the actual country. And even better, not being in Switzerland, it isn’t mountainous and cold. So let’s make Barcelona the capital of Switzerland. The Swiss already speak three languages so they’ll easily pick up a fourth which means even more people will chat in Catalan. Barcelona will get all the Swiss bureaucracy money and Catalunya will be allowed to help itself to all the priceless treasures that fleeing Nazi Generals hid in the safety deposit boxes back in 1945. This new income will kickstart the Catalan economy, the wealth with spread to Spain and a new spirit of brotherly love will sweep across the land as everyone thanks Barcelona for saving Spain by being the coolest city in Europe. Problem solved, I think you’ll agree.